Welcome to the Going Gluten-Free Cookbook Set! 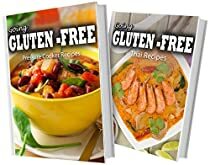 A series of Gluten-Free Cookbooks for home cooks and food enthusiasts! Looking For Gluten-Free Ideas That Actually Taste Great? Explore the world, and make cooking an easy task with Tamara Paul, as she takes you through different cultures and cooking techniques all carefully designed to please the avid Gluten-Free follower! You’ll find a plethora of quick, easy-to-make, cheap, and delicious recipes for every course and every occasion. The best part – you’ll never have to worry about flaring up again! Tamara delivers delicious recipes for the entire family. She was a working mother when she decided to write these books, she understands the constraints that come with the territory. Purchase each book one-by-one or check out the compilation books by Tamara to get a discount on multiple book purchases. This is truly – the best Gluten-Free cookbook set out – purchase your copies today and see why!